Recently I've become a dedicated "Sewcialite" at my LQS. We meet every Monday and work on our projects. Some of us are prolific - git 'er done types... and some of us (such as yours truly) are of the "... it's all about the process..." variety. Perennial starters, stoppers, re imaginers, tuck away for another day types. Additionally I'm a prolific "check out what's new" type. I set up, grab my coffee and go for an informal fabric stroll up and down the aisles imagining future projects and how "that fabric would be just perfect for..." Since I am also a compulsive scrappy quilter type (I never met a scrap I didn't like) I'm big on visiting the remnants section. With me - no piece of fabric need be an orphan. A few weeks back as I was leaving I was quietly presented with a white box. I was asked if I was interested in doing a friendship block. I was surprised. I really wasn't sure what was in the box or what I was getting myself into but it was one of those "yes - and" moments so what could I do but say "yes!" I took the box home and opened it. It was full of black, red, and white fabrics of all prints, stripes and sizes. Several blocks were already completed. They were beautiful. The only requirement was the block should be "somewhere between 12 - 14 inches". My challenge would be making the block. 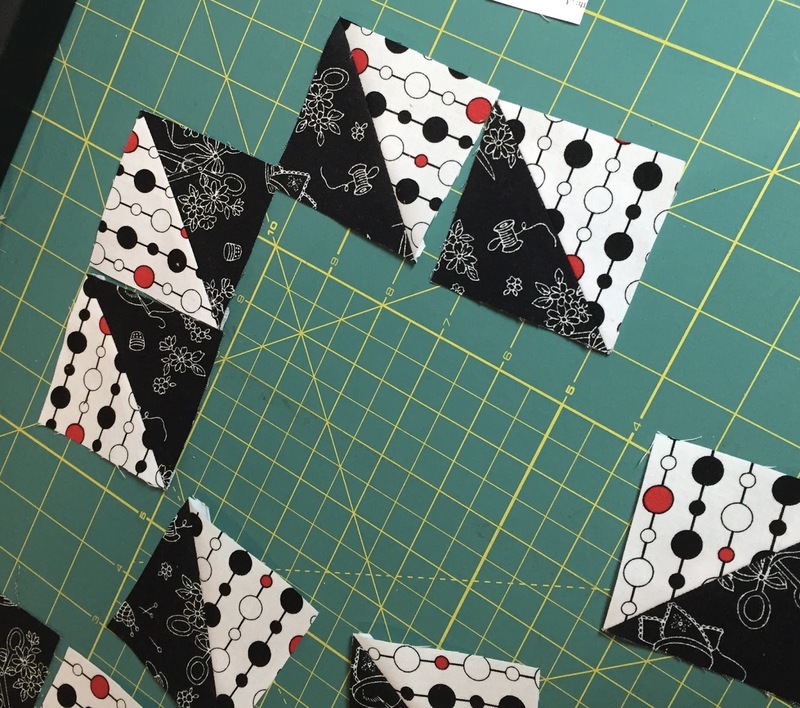 I rummaged through the fabrics and found a number of half square triangle blocks already made. With those as my springboard I decided to do the "bearspaw block". I spent most of the afternoon (and next day) looking through books and websites looking for the required dimensions. I got bogged down. Plan B - make more HST's and do pinwheels. Once done - I wasn't really satisfied. The blocks looked flat next to each other. I moved to another project and let this problem stew for a bit. And then it came to me. I bought Liberated Quiltmaking ll several years ago. 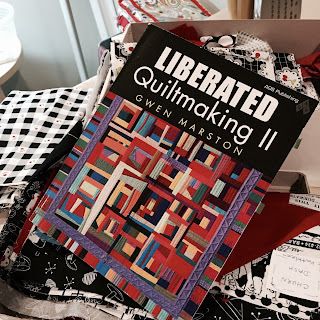 I became a big Marston fan when somewhere in the first chapter - Gwen solved all my eternal quilting dilemmas with this simple statement (or words to the effect) "if it's too big chop it off - if it's too small add more". My love for making quilts was pretty much off to the races after that. And so it was time to revisit the block entirely. A bit more slicing the dicing and voila! Liberated Party Pinwheels! This block finished at 13.5 inches and it has a lot of movement in it! Another "yes ... and" opportunity met with success. (Linked to the Needle & Thread Network). That new blot is gorgeous! I hope you are please with the movement/depth that you've achieved with your "slicing and dicing". 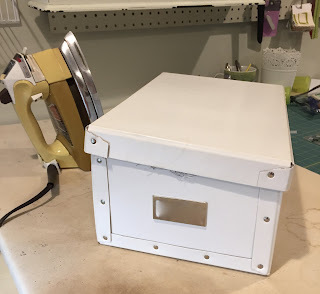 Thanks, Judi, for posting to The Needle and Thread Network's WIP Wednesday! Your block is great! Love your attitude and outlook. Thanks for sharing your process with us. Love your block. I really need that book! I believe she has a new book out also. What FUN blocks you created! !